Blue Sky Alpacas Handspun Organic Cotton, the perfect addition to our expanding line of feel good yarn. Grown from 100% organic cotton, there are no pesticides, herbicides, agro-chemicals or dyes used in the growing, harvesting or production of the fiber. 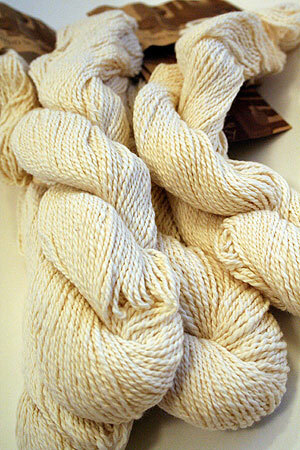 The yarn is hand spun on drop spindles by a women’s cooperative in Arequipa, Peru. Knitters will love the rich feel of the yarn. They’ll also feel good, knowing that the yarn production is helping preserve a centuries-old tradition of eco-friendly cotton cultivation in Peru and improve the lives of the poverty-stricken women who live there. Working with a local charity, Blue Sky Alpacas employs women to spin Hand Spun Organic Cotton, providing them with a living wage that helps them care for their families and send their children to school.